Fabulous contemporary design, luxurious accommodation, glorious sea views, a dreamy infinity pool and direct access to the translucent waters of the Aegean. Rising discreetly in its privileged seafront position on the east coast of Alonissos, Kolokithi Bay is a feast of architectural ingenuity, an aesthetically inspiring jewellery box of design that never ceases to delight. With so much to explore and enjoy both inside and out, a week or two spent at Kolokithi Bay will never feel enough. Inside: accommodation at Kolokithi Bay is spread over a main house and a garden house. The property’s vivacious contemporary design fuses an inspiring architectural concept with quality fittings, materials and furnishings to create an inspiring, luxurious ambiance. The main house is divided into four distinct sections. The first is home to a voluminous open-concept communal space, featuring an enormous L-shaped sofa, a dining area, and a fabulously equipped bespoke kitchen. A series of floor-to-ceiling, multi-aspect picture windows on two sides frame the green, tree-carpeted surrounds, while on the third, a pair of outsize glass doors open onto the main terrace and bring in fabulous views of the sea. The airy, luminous feel of this communal space is further enhanced by polished cement floors and lofty, white-beamed vaulted ceilings, all architectural motifs that run throughout the property. A few steps lead from near the kitchen into a hallway and the second section of the house. Here there is the first bedroom, a spacious, multi-aspect double with sea views and access to a furnished terrace. A flight of stairs (without bannister) leads from the hallway up to the second bedroom, another double, also with sea views and access to a wonderfully panoramic terrace. These two bedrooms share a shower room located next door to the first bedroom. Continuing along the hallway, one comes to the third section of the main house, home to the master bedroom, a spacious double, with large picture windows, sea views, a glass door leading out onto a furnished private terrace, an en-suite WC, and a stone feature wall dividing the bed from a voluptuously luxurious bathroom with tub looking out onto a walled ornamental garden, and a separate walk-in shower. The fourth and final section of the main house is on a lower ground floor, accessed externally via a wooden boardwalk. Here there is a sea-view double bedroom with en-suite shower room and private terrace, and a laundry room. The garden house is located in the grounds just a short amble from the main house. The entrance opens into a comfortably furnished living area, off which one accesses two double bedrooms, each with an en-suite shower room. Stairs lead up from the living area to an open mezzanine loft, home to a twin bedroom with a small en-suite shower room. 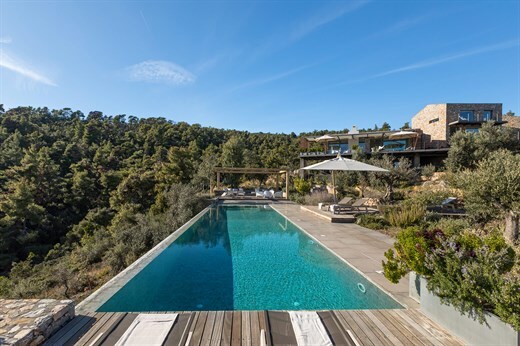 Outside: the accommodation at Kolokithi Bay sits amidst extensive grounds, which have been landscaped ingeniously to make the most of the property's glorious setting above the sea. A weave of paths crisscross the fragrant gardens, connecting the two houses, a convivial, panoramic al fresco dining area (served by an outdoor kitchen with barbecue), the fabulous infinity sea-view pool with its shaded deck, and the sea access below. The main house has a series of connected boardwalk terraces that run the full length of the sea-facing façade. The largest area is accessed from the open-concept living and dining area and kitchen, and is comfortably equipped with sofas, chairs, a dining table, shade and an outdoor fireplace. A few steps lead up from here to the more shady terraces, accessed from the two ground floor bedrooms. The bedroom on the first floor, and the one on the lower ground floor also have private terraces. For guests arriving in Skiathos on a morning flight, a taxi transfer to the port and ferry/hydrofoil crossing Alonissos are included in the rental fee for clients staying at Kolokithi. If your flight arrives in Skiathos in the afternoon/evening after the last ferry/hydrofoil has left, a taxi from the airport to the port is still included, but a private sea taxi is not (however, we would be happy to organise for you). In this case, the return leg from Alonissos to Skiathos Airport for your flight home is of course still included. Kolokithi Bay has some stairs and steps without banisters or handrails and several drops. For this reason we do not usually accept bookings for Kolokithi Bay for groups with children under the age of 8. For more information, please get in touch. Kolokithi Bay features a fantastic infinity pool, offering swimmers stunning sea views while in the pool. There is a drop from the infinity edge so we recommend children are supervised at all times when using the pool. Please refer to our general safety page if you would like more information about infinity pools. Kolokithi Bay has an excellent ecological pedigree: as water is very much a precious commodity on Alonissos, the villa has a small desalination unit used in the high season. Water is also harvested from the roof when it rains and collected in tanks under the house. The water is twice filtered and finally treated with an ultra violet purifier before being sent to the taps. Kolokithi Bay sits above the sea about half way up the east coast of Alonissos. The seafront tavernas, amenities and harbour of Steni Vala are a 10 to 15-minute drive (depending on whether you take a track or the coast road) or a 30-minute walk up the coast. The island's main port, Patitiri, and the historic capital, Alonissos Town, are just a 20-minute drive away. "Kolokithi Bay is an amazing villa in an amazing setting with views to die for. It's better equipped than my home and has plenty for teens to do." Kolokithi Bay is an amazing villa in an amazing setting with views to die for. It's better equipped than my home and has plenty for teens to do. Kolokithi Bay was wonderful. We really enjoyed he access to the sea and the water quality, together with the pristine atmosphere of the island.